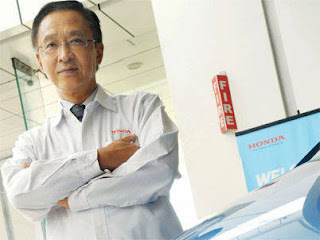 Hironori Kanayama, President of Honda Cars India, Ltd. The plush showroom in Noida is abuzz. Monthly footfalls have surged from 200 early this year to about 500. From worrying about poor sales, the dealer is now grappling with a three-month-long waiting list. Business hours are often extended and not just at the Noida dealership to manage the customer surge. It wasn't always this way for Honda Cars India Ltd (HCIL). A slew of missteps from mispricing premium hatchback Jazz, to ignoring the mass market and, subsequently the diesel segment when the price differential with petrol widened coupled with a few natural calamities elsewhere like an earthquake in Japan and floods in Thailand hit HCIL hard. Between fiscal years 2007 and 2013, market share steadily dropped from a peak of 4.44% to a low of 2.74%. Volkswagen's Vento and Hyundai's Verna eroded Honda's leadership position in sedans, where the City once ruled the roost; and models like the Hyundai Elantra and Toyota Camry began giving Honda's Civic and Accord a run for their money in the executive sedan and premium sedan segments, respectively. "Honda was an aspirational brand, rich in features and looks. But it also came across as an overpriced and highly decontented [industry terminology for removal of features] vehicle," says V Ramakrishnan, managing director at Frost & Sullivan India, a consultancy firm. The short point: Honda wasn't getting anything right: neither product, nor price nor positioning. It required just one launch to turn things around. The Amaze, launched just two months ago, has helped HCIL, according to SIAM, jump one place to No. 5 in May, ending the month with a share of 5.63% of the Indian car market. With total sales of 11,342, HCIL's sales grew 9.8% in May over a year ago in a sluggish market where competitors like Maruti (decline of 13%), Toyota (decline of 35%) felt the brunt. "This is our counterattack. Amaze is our first weapon. We have many more," says HCIL CEO Hironori Kanayama. Adds Jnaneshwar Sen, senior V-P (sales & marketing): "We have managed to hit the sweet spot." It may be just one model that has reversed HCIL's fortunes, but to create that winning product called for a complete overhaul of the company's DNA an exercise that began two years ago. Honda's biggest challenge was to learn new and cheaper ways to develop and produce cars in India. Earlier, Honda developed global models and then tried to localise for each new market. For the Amaze, inputs from India began trickling in right from the beginning of the R&D process. Between the Brio hatchback launched in 2011 and the Amaze, HCIL worked aggressively to contain costs by developing local vendors without compromising on quality. From 102 vendors at the pre-Brio stage, HCIL's vendor base has now grown to over 200 (the majority of them non-Japanese), helping Honda achieve 92% localisation. Aditya Auto is one of HCIL's newer vendors, which began working with the carmaker three years ago. HCIL was looking for a cost-efficient way to produce window regulator systems in India that met its quality parameters. It had traditionally used a wire type rope mechanism that was imported from Thailand but was costly. "Honda gave us targets and asked us to give them solutions. We fundamentally changed the design of the window regulator," says Mihir Jayaraman, the vendor's business unit head. In the process, Jayaraman also brought the cost down by 35%. The decade old vendor, which has annual revenues of Rs 250 crore, now also supplies to Honda Thailand. HCIL also reworked its branding and marketing strategy. It began by first understanding how the Amaze buyers would be different from say a City buyer. The latter is typically a well-todo discerning customer who enjoys the finer aspects of life, for whom brand is important, who is a trendsetter (and hence experimental) and has reached a certain status hence takes certain things for granted. The Amaze buyers, HCIL reckoned, would be more conservative, seeking products that offer peace of mind; that meant not just an affordable price tag but also a reasonable cost of ownership. For them, status, comfort and safety are important. Also, more Amaze owners would tend to drive their cars than City owners; and more of them would be in Tier II cities. That's one big reason for HCIL expanding in smaller cities from 150 outlets in 90 cities to 162 in 102 by the end of this fiscal year. Alongside, the showrooms, which have always been plush and spacious with plenty of glass and chrome are getting an informal touch. Now salesmen in T-shirts add a touch of warmth and casualness to the customer care experience. "We learnt a lot from the Brio. We want customers to get the Honda brand experience with a more warm and approachable feel," says Sen. In an attempt to change the traditional customer base from chauffeur-driven to ownerdriven, HCIL has spruced up the owners' lounge at its service centres by enlarging it and adding more facilities like PCs, TVs, and snacks and coffee counters. To change the perception that Honda is an expensive brand and only for sophisticated (City) customers, HCIL has introduced a Rs 9,996 maintenance package for up to two years or 40,000 km. "The Amaze compares well with the Dzire on maintenance costs," adds Sen.
Honda also rejigged its advertising and marketing strategy. "Honda had a very inward-looking mentality," says an advertising executive who has worked on the Honda brand for close to five years. The decisions were largely driven by Japanese expats whose understanding of India and Indians was often poor. "Its ad campaigns were very English, very conservative, very print-driven and often did not realise the power of TV in India," adds the adman who did not want to be named. Traditionally, Honda believed that technology lay under the bonnet and hence stressed on engineering excellence. "But the Koreans changed the game from being what's under the bonnet to equally about what's on the dashboard. But Honda was cussed, stubborn about it," recalls the executive. It would show more car angles than consumer benefits. So the brand became inaccessible even as other companies like VW came and created a marketing buzz. "The reins are now with the Indians. I haven't met the Japanese even once," says an ad executive working on the Amaze account. HCIL's typical ads were high on gloss, with brochures and designs that were very European with skyscrapers in the backdrop. Even the Brio campaign "It loves you back" was for an English speaking audience. In contrast, the Amaze campaigns showcase a slice of a regular Indian's life, with kite flying, Holi colours and India Gate thrown in. And they're now TV-driven. The ad film was shot in two settings â€” one in the north and the other in the south and has been dubbed in 14 Indian languages to cater to a very heterogeneous market. The objective clearly was to have an imagery similar to that of Maruti's advertising. "Their campaigns suggest they have got the insight right. They have become a friendlier brand," says Naresh Gupta, managing partner, Bang in the Middle, a boutique advertising firm. Gupta, an ex-Dentsu executive, had worked on the Honda account earlier. HCIL's newfound drive in India ties in with its global ambitions. By 2017, Honda is looking at sales volumes of 6 million cars with emerging markets bringing in half of them. Getting the India act together is an imperative particularly when Honda is struggling in the other emerging market that matters, China, where its market share has slipped from 5.5% in 2008 to 3.2%. "Honda made a strategic misstep in China in 2008 mainly by scaling back its expansion plan after the financial crisis; it was illprepared for the soaring demand in China that followed post-2008," says Bill Russo, a senior adviser at consultancy Booz & Co.
Back in India, it is still early days, but HCIL will take heart from one statistic: some 88% of the customers who visited Honda showrooms to check out the Amaze had never owned a Honda car. "The Amaze is bringing a lot of new customers into the Honda fold. It is a great source of future business for us," says Sen. And roughly a third of Amaze customers are from Tier II cities. What has always been HCIL's trump card is that those who bought Honda cars had few problems with them. In the JD Power rankings on parameters like customer satisfaction and product quality, it's always been ranked amongst the top 2. "Honda may not have the sales but it always enjoyed great equity among Indian consumers," says Mohit Arora, executive director, JD Power Asia Pacific. "Now, with new models they are fixing their biggest problem of the right product-price equation. Maruti should be seriously worried," he adds. Subhabrata Ghosh, CEO, Celsius 100, a consulting firm focussed on the auto sector, says the task of moving down the price spectrum is easier than going bottom-up. "Honda is a socially aspirational and emotionally satisfying brand. It is not very difficult for a brand like that to come down a step below and become accessible to a broader set of customers." In contrast, Maruti has found it tougher to move from the mass market into more exclusive segments. There will be new challenges along the way. For instance, the new set of customers will use their cars more conservatively than Honda's earlier buyers of the more premium cars; Amaze buyers will look for a replacement only after 5-7 years as against the more affluent City customer who will typically buy a new car after 3-5 years, says Ghosh. At the same time, with more customers coming from smaller cities, where road conditions may not be the best, there could be compromises on preventive maintenance. CEO Speaks On Honda India's biggest challenge: We are weak on our cost competitiveness. We are improving it but we need to work on it harder. On market share: Our target is not just to become big in India or grow our market share. We want to be the most trusted company. We want to expand our universe in India but also maintain and further increase our quality and customer care. On Honda India and its global relevance: India is a very unique market, very different than even other emerging markets. Half the market here is of hatchbacks. I am not sure how transportable to other markets are the lessons we learn here. We do not have big export plans - not more than 10%. On his management style: I have my food in the plant canteen. I queue up and often have Indian food. My rationale is if my people are looking left, I cannot look right. That is wrong. It creates hurdles. I have to be part of them. We need to move in the same direction. I often do direct meetings with people below to get their views. On his toughest challenge: When I went to Honda China, quality, sales and service was a huge concern in 1998. We used to import Accords then. By the time I left we were exporting cars to Europe. Our quality there became world-class.